The third of four releases in 2011 by the US Mint as part of its Presidential $1 Coin Program will be the 2011 Rutherford B. Hayes Presidential $1 Coin. Hayes only served one term as President from 1877-1881. Like his presidential predecessor, Hayes rose to prominence during the American Civil War where his bravery resulted in his achieving the rank of Major General, but also resulted in him being wounded five times. His election to the Presidency was controversial as he lost the popular vote to his opponent Democrat Samuel J. Tilden. He ended up winning the office by one electoral vote after a congressional commission awarded him twenty disputed votes in exchange for his assurance that he would end the military occupation of the South. He kept his word, as well as his promise to only serve one term and retired in 1881. 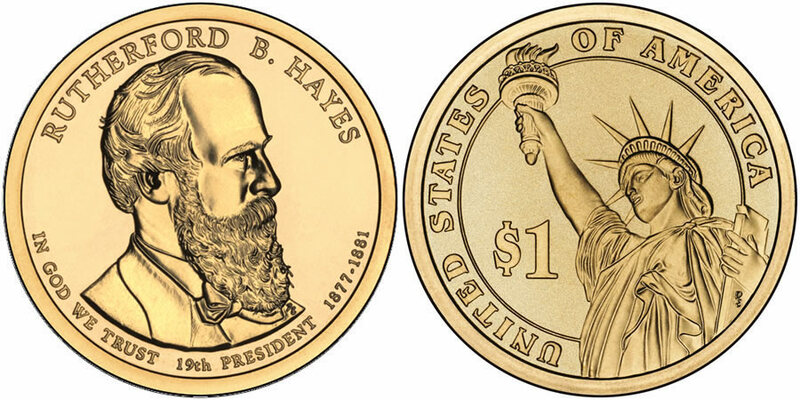 The portrait of Rutherford B. Hayes found on the obverse of his coin was designed by United States Mint Sculptor / Engraver Don Everhart. Surrounding the portrait are the inscriptions of "RUTHERFORD B. HAYES," "19TH PRESIDENT," "1877–1881" and "IN GOD WE TRUST." The reverse of all of the Presidential $1 Coins features an image of the Statue of Liberty which is found in New York Harbor. It was designed by Don Everhart and also includes the inscriptions of "UNTIED STATES OF AMERICA" and "$1."